(a)It is a world of superlatives, a world of absolutes - ‘Infinite’ Existence, ‘Absolute’ Knowledge and ‘Unconditional’ Bliss. It is marked by ‘Omnipotence’ and ‘Omnipresence’. It naturally follows that to ‘create’ a world of multiplicity, the ‘unity-principle’ loosens its cohesiveness and its different aspects get delinked from each other. The resultant world of multiplicity cannot reflect the unity-principle. Its multiplicity asserts itself in such a way that each ‘component’ of the multiplicity acquires independence, uniqueness, a separative identity, a sort of ‘individuality’. In the case of human beings, this ‘individuality’ maintains its uniqueness through the instrumentality of the ‘ego’. The ego is a principle that tries to strike an optimal balance between the different components that exist within each unique individual. In the manifestation, the ego-centered individuality has lost all memory of the unity-principle of Sachchidananda from which it has been metapsychologically derived in terms of consciousness. This is expected as otherwise, its uniqueness could not develop itself into its fullest potential as a separative entity. If it recovers the true unity-principle, it can immediately lose its separative identity. Sri Aurobindo is concerned with reconstructing the unity-principle in the world of dualities, in the matrix of multiplicity. But He wants to do it in such a way that the multiplicity is not dissolved in the ocean of oneness. He wants to maintain the uniqueness of individual forms while yet establishing the unity-principle that transcends all forms. 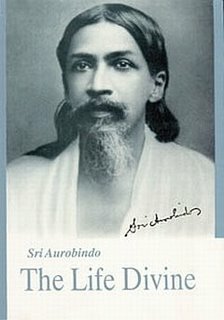 In Chapter VII of The Life Divine, Sri Aurobindo describes how the ego-centered individuality perceives reality. (b)	The level of Reason. Our first contact with the world is through our senses. The moment a newborn emerges from the maternal womb, its sensory system is bombarded from all sides-- light, sound, touch, taste and odours. The onslaught is too much and unless the newborn sleeps for long hours, these experiences cannot be assimilated and integrated in his sensory schemata. The baby enjoys the world through the senses. He enjoys the sweetness and warmth of his mother’s milk through his senses, he enjoys being rocked and cradled through his senses, and he enjoys being put to sleep by a lullaby through his senses. He learns bowel and bladder control through a series of sensory games. The first game we play with an infant -- peep-boo is an intense sensory training--- he discovers and rediscovers his mother hid behind the curtain -- this instills in him the idea that his mother is permanent. This gives a sense of security and sows the seeds of faith. It also imparts the joy of love. It builds up the sense of adventure. It is therefore very natural that the perception through the senses establishes a basic and deep impression in the child’s psyche. This is so fundamental that even when the child becomes an adult, whatever is conveyed by the senses is usually taken as reliable and full proof. Spiritual seekers had realized that ‘sensory perception’ was just one level of experience. There were ‘other’ levels too. Even Science conforms to this view. The primal perception that the sun moves around the earth is a phenomenon that is pragmatically ‘true’ while being scientifically ‘false’. Even the terms ‘sunrise’ and ‘sunset’ are technically untrue. But they are phenomenally true. We schedule our daylong activities around these two terms and we cannot deny their practical significance. How do we deal with a phenomenon that is scientifically or rationally false but phenomenally true? WE HAVE TO ACKNOWLEDGE THAT THERE ARE MANY LEVELS OF EXPERIENCE AND THE TRUTH-SEEKER HAS TO SIMULTANEOUSLY ACT AT DIFFERENT LEVELS, FOR EACH LEVEL HAS ITS CONTRIBUTION TO THE WHOLE. Take the example of sensory experience vis-à-vis sensual enjoyment. An ordinary person may be so satisfied with sensual enjoyment that fulfills his lust and passion that he may consider the satiation of the senses as the highest pleasure worth pursuing! This is how hedonism prospered. This is also why an entire industry pursuing sensual pleasure dominates the market of consumerism. A spiritual seeker has a different experience. To him, the senses are not merely meant to fulfill ‘lust’. They provide a field and matrix to manifest the ‘Divine Bliss’. Or else, unable to tackle the lure of the senses, he may indulge in an ascetic discipline that ignores and deprives the senses. For an integral seeker of Truth, neither the hedonistic enjoyment of the senses, nor an ascetic impoverishment of the senses can reflect ‘Reality’. Rather, he would acknowledge the different levels of experience and venture to experiment whether the Higher Reality that reflects Absolute Bliss can be experienced in a world of dualities. For that, a technology of consciousness has to be worked out. (a)	Harnessing the suprasensorial levels of experience. The first of the suprasensorial levels is REASON, which has already been stabilized in the repertoire of human experience. There are yet other levels of supra-rational levels of experience that surpass Reason and which have been available to mystics, yogis and exceptional individuals. Sri Aurobindo envisages that with a progressive evolution in consciousness, these faculties will be stabilized in a broader way in the human psyche. (b)	We not only have our usual sensory organs but we also have dormant ‘inner’ senses in an ‘inner’ or ‘subliminal’ personality stationed behind our surface being (the surface being is what is studied as personality in psychology ). Under exceptional circumstances, we have inklings of these ‘inner’ senses. Thus during meditation, these inner senses are activated leading to phenomena like ‘visions’, ‘hearing’ church-bells etc. In phenomena like hypnosis, telepathy and clairvoyance, it is the ‘inner’ senses that are activated. In Sri Aurobindo’s scheme of personal growth, the inner being has to be developed and fused with the surface being. (c)	Our bodily senses can themselves undergo a transformation. Sri Aurobindo describes that the transformed sense will reflect a purer action that cannot be distorted easily; will sub serve a fourth dimensional perspective and will actually be a power of the Spirit. He has developed this concept in meticulous detail and interested readers can refer to the chapter ‘The Supramental Sense’ in His book-‘The Synthesis of Yoga’. Thou who hast lived as in walls, thy soul with thy senses wronging! Poison and nectar one has dispensed to thee, luring thee, leaving. We two together shall capture the flute and the player relentless. Chased the delights that wound. But I come and midnight shall sunder. When thy desires I have seized and devoured like a lioness preying. I have a snare for his footsteps, I have a chain for him taken. Follow the dance I shall teach thee with Shyama for slave and for master. Trample Delight that submits and crouch to a sweetness insulting. Take thy place in the Ras* and thy share of the ecstasy after. *The dance-round of Krishna with the cowherdesses in the moonlit groves of Brindavan, type of the dance of Divine Delight with the souls of men liberated in the world of Bliss secret within us. !